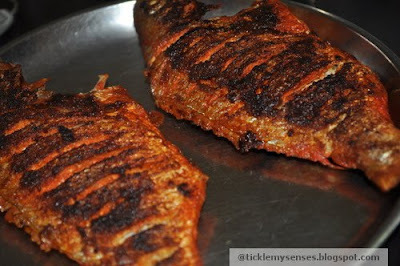 One of the tastiest way to have fish is by shallowing frying it with the Mangalorean Meet Mirsang paste. 1. Take all masala ingredients in a bowl, add water to make a shiny paste. Do not make runny or too thick. 2. Clean fish well. Dry with paper towels then make horizontal slits along length of fish. 3. Marinate cleaned fish with the paste for minimum 10 minutes to maximum 1/2 hour. 4. To fry: In a hot tawa ( traditionally fish was fried on a cast iron tava/ pan) heat sufficient vegetable or coconut oil to almost smoking or very hot. Place fish carefully in oil , reduce heat slightly and do not move fish till done on that side. Then turn over and cook the other side. Add more oil as require to prevent the masala burning. 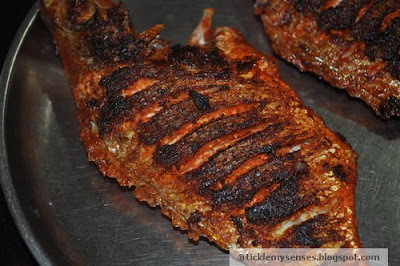 Masala Fried Fish is ready. Serve hot with boiled rice and daaliso saar (lentil soup). wow...its soo tempting !! You've got a lovely blog with delicious recipes! !